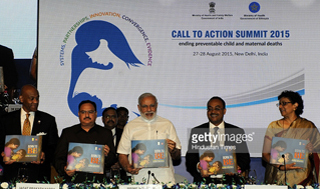 We, the Ministers and Heads of Country Delegations of 22 countries, gathered here in New Delhi, India from August 27- 28, 2015, for the Third Global Call to Action Summit, 2015 applaud the remarkable progress achieved in reducing maternal, newborn, and child mortality. We acknowledge the global partnerships, support and resources mobilized to achieve these gains, and save over 100 million lives since 1990. We are at a pivotal time as a global community with the Millennium Development Goals (MDGs) completing at the end of 2015, and nations preparing to embrace a universal and transformative sustainable development agenda that leaves no one behind and ensures the health and well-being of all, particularly women, children and adolescents. Recognizing the centrality of the health and well-being of women and children in shaping prosperous and sustainable societies, we commit to accelerate efforts to end preventable child and maternal deaths in support of the Every Woman Every Child Global Strategy for Women’s, Children’s, and Adolescents’ Health.